For some, the romance of travel is at the heart of romance itself. For couples who share that feeling, a destination wedding may be the only way to go. A getaway to a place where love is in the air. And the water. Where the wonders of the world only multiply the more you explore. With attractions you’ll only know are indispensable when you see them for the first time. Take a leap into the great imaginable. There is nothing more romantic than getting married in Paris. The Parisian atmosphere lends itself to romance, European charm and style will give your ceremony a truly unique and memorable atmosphere. The popularity of destination weddings is constantly increasing and more and more couples are looking to get married in an exotic location. France is the perfect backdrop for this type of wedding, as it has magnificent landscapes and an architecture that will help you to give a very romantic tone to that special day. 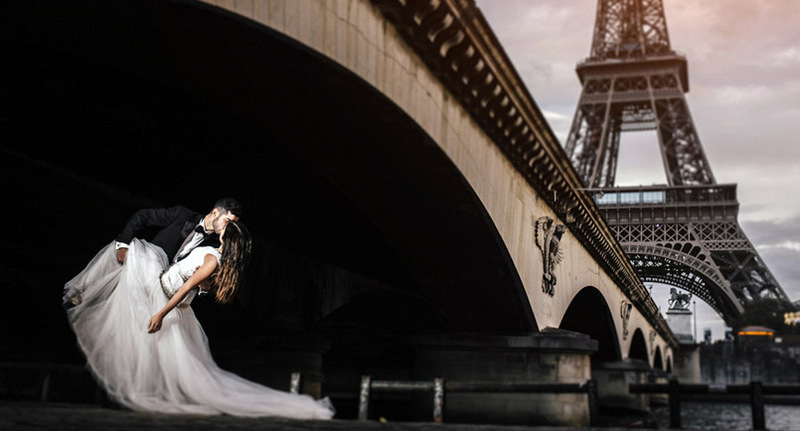 While Paris was always the perfect destination for a couple looking to get married, you do not have to limit yourself to the city of light, since there are so many options to choose from. Whether you want a small wedding in a garden or a large list of guests, you will find what you are looking for in France. Miami Beach Style, Palm Beach, Marco Island and more. We offer natural beauty and glamorous destinations for destination weddings in Florida near the attractions that make Florida one of the best honeymoon locations in the world. We will pamper you with the award-winning service, making your special day and your stay everything you have dreamed of.Certified wedding planners. Sophisticated style and a passion for perfection. Leading Photographers and Videographers, florists and more. Beachfront weddings, intimate receptions, any size and scene. 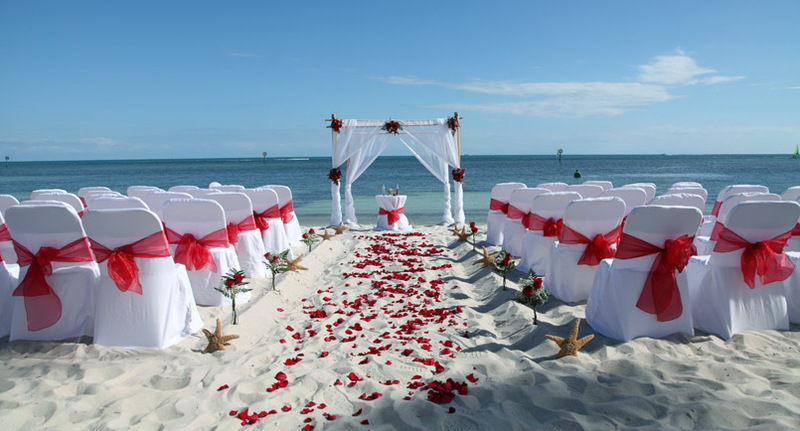 South Florida has been blessed with some of the most wonderful places to hold a beach wedding.
. The Riviera of America, Miami Beach, is located on an island located between Biscayne Bay and the Atlantic Ocean. Miles of clear beaches, large hotels, shops, restaurants and lots of nightlife make Miami Beach one of the favorite destinations in the country. The very trendy South Beach, which brings all the charm and Art Deco style of its buildings, also helps to make Miami Beach a great destination for weddings. Venice is an ideal panorama for the most romantic event of your life. Its magnetic charm and inimitable fusion of the qualities of its people so welcoming next to its cuisine that is second to no one in the world, attract thousands of couples every year. But what if you’re already married? We advise you to relive one of the most important moments of your life over and over again – but this time in a city without pairs; A city that radiates romanticism and love that is so simply Venice. Imagine declaring yourself again and again in one of the most beautiful Palaces, or in a secret garden of a palace, or in a gondola on the Grand Canal! Our ceremony texts are very fascinating and exciting. Masters of ceremonies, who have more than 20 years of experience in this sector, know how to get in tune with the future spouses, making them feel at ease and through a personalized text, the future spouses are encouraged to give the correct importance and value To their union. The text of the ceremony also includes the change of votes and rings. You will then sign and receive a Certificate of Marriage that, although not legally binding, will constitute an indelible memory for you. More and more frequently couples who decide to give up a traditional shared wedding with family and friends for an unforgettable journey and marry themselves somewhere in the world that especially appeals to them, and above all, where they can get a unique photo report . We aim to ensure the success of each of the weddings we plan. Thanks to the exclusive and personalized dedication of our team of experts, the bride and groom will be able to enjoy in a relaxed way every part of the process. We are prepared to bring originality and sophistication to the most important day of your life. We approach the celebration of the wedding in an integral way, we transform all type of spaces and we work in any destination. The mission of our professionals is to turn your “great day” into a special and unrepeatable moment. 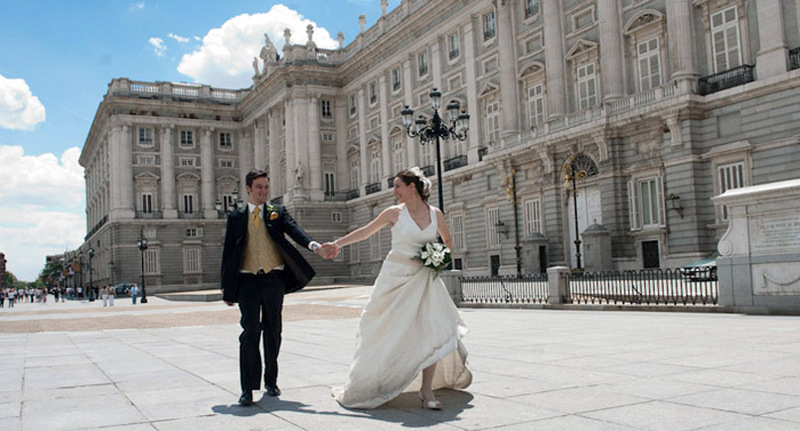 Madrid is a wonderful and historical place for the celebration of your wedding dreamed by its impressive architecture, parks and monuments that will give a special touch to your unforgettable and special photographs and video that our professionals will take during the whole event. The Puerta del Sol is one of the most known squares in Madrid. In it you will find points of interest as interesting as The Bear and the Madroño and Kilómetro Cero. A few meters from the Puerta del Sol and the Royal Palace we find the Plaza Mayor in Madrid, one of the oldest in Spain built by Juan de Herrera and Juan Gómez de Mora in the 16th and 17th centuries. El Retiro is Madrid’s best-known park since its opening to the public in the 19th century. The Plaza de Cibeles and its fountain are one of the most representative places in Madrid. Cibeles is the place chosen by Real Madrid and the Spanish team to celebrate the victories. The Royal Palace of Madrid is the official residence of the Spanish Royal Family. It was built between 1738 and 1755 and is the largest royal palace in Western Europe.